Dr. Eddie Armas M.D. is a general practice doctor located in Miami, Florida who provides his patients with quick access to personalized, top-quality medical care with a strong focus on preventative care. Dr. Armas experience in the field, as a pioneering figure in medical weight loss and Anti-Aging has led to insurmountable success stories throughout the years and his proven reputation has led him to be the medical consultant of CNN Español, Univision and many other major media channels. 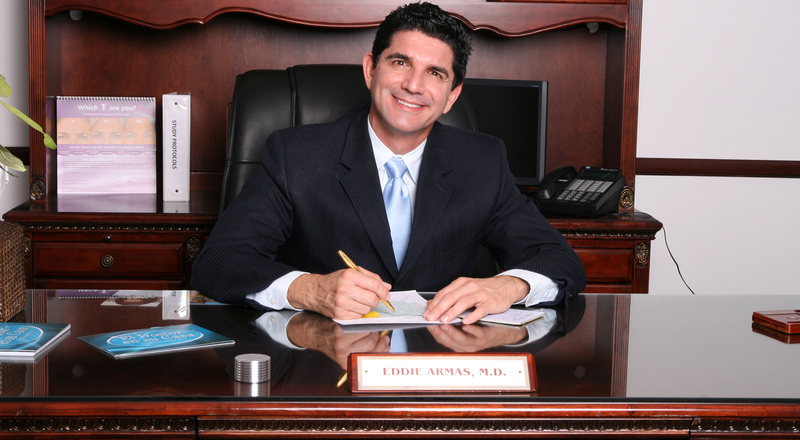 With over 25 years of experience in the medical field as a general practitioner and principal investigator in pharmaceutical research, Dr. Eddie Armas always sought out to find innovative yet practical solutions to the most common health issues. Of all the health conditions that he has dealt with throughout the years, obesity and anti-aging treatments became his main focus due to its destructive effect on the human body. Dr. Eddie Armas was born In San Jose de Las Lajas in the province of Havana, Cuba. Since he was a small child, Eddie always dreamed of becoming a doctor, a dream that came true on August 15 of 1987 when he graduated from the Instituto Superior de Ciencias Medicas de La Habana in Havana, Cuba. He finished his residency in family medicine at the 10 de Octubre Clinical Surgical Hospital. In 1991, Dr. Armas arrived in the United States, where he quickly adapted (and fully enjoyed) the American lifestyle. In 1995 he married and subsequently had two children, Alan Daniel and Carolina Loren. While working full time in the health-care field, Dr. Armas diligently studied for his Board exams, and in 2002 his efforts were rewarded with his American medical license. Since then, Dr. Armas has been working in different hospitals throughout South Florida, as well as in his private practice. Cosmetic Anti-Aging treatments like Fillers, Botox and Plasma Therapy. Skin tightening with Gentle YAG Laser or Ematrix. Sclerotherapy with Injectable and Laser Vein Removal.